Weima America's Single Shaft Shredder, recently made available through Jorgensen Conveyors, can shred light materials such as aluminum or magnesium, but also steel shavings, copper and brass. The innovative V rotor with Super V cut cutting gap adjustment guarantees optimal cutting geometry. The result: Homogenously shredded material, high throughput, low wear and energy consumption and resistance to foreign material. 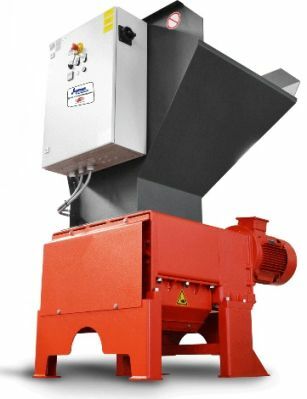 The Industrial 4-Shaft Shredder is designed for many heavy-duty reduction applications. Metal is powerfully torn and shredded by the talons of the cutting discs, then pressed through the cutting gap of the clearing discs and finally discharged through a screen which is mounted under the cutting discs. These machines shred everything down to a size that is ready for reducing space, recycling and selling. In the spring of 2018, Jorgensen Conveyors, Inc. formed a business alliance with Weima America, Inc. Integrating Jorgensen's line of conveyors into a complete chip processing system, which includes the shredding and briquetting of metal chips and shavings with Weima's equipment, is the ideal starting point for further processing or selling of metal scrap. With aluminum, magnesium, copper, brass, steel and other metals, a volume reduction of up to 90 percent is possible. This additional processing and volume reduction translates to savings in material handling, labor, increased scrap value and the extraction of cutting fluids to be reused. At IMTS 2018, attendees will see the complete Chip Processing System including Jorgensen's patent-pending MunchMan® II Conveyor integrated with a Chip Shredder and Briquette Press.